Toni Francesc is delighted to invite you to the grand opening event of the Trinity Place flagship store at 61 Broadway in NYC on Friday, September 28, 2012, from 11:30am ET through 6:30pm ET, where Trinity Place will offer free live music performance, gifts and contests. Visitors will also be able to receive 20% off all new merchandise in the store. Customers will find a special collection exclusively labeled Veneno en la Piel by Toni Francesc, featuring glamorous and sophisticated party and cocktail dresses with a young, feminine style. Toni Francesc was selected by Trinity Place Department Stores in their choice of quality brands from around the world, bringing together a mix of modern American and European styles. 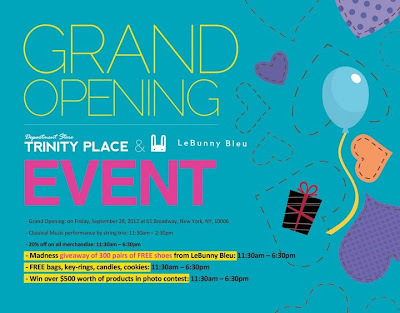 Other brands available at Trinity Place include Goldie London, Miss Patina, Sylvia Lee, Trollied Dolly, Neoclassics, Pact Apparel, Rock'n Royalty, Burkinabe Couture, Matatraders, Thursday Friday, Insight 51, Jones and Jones, Sugarhill Boutique, Leather Satchel, LeBunny Bleu, Oh My Love and others.